The panelists and moderator of "Meet The Hi-Res Music Creators," which took place on Tuesday, January 6. Pictured L- R: panelist Rob Friedrich (GRAMMY®-winning producer/engineer, Five/Four Productions), panelist Leslie Ann Jones (GRAMMY-winning engineer and Skywalker Sound’s Director of Music Recording & Scoring), panelist Ryan Ulyate (producer and engineer [Jeff Lynne, Paul McCartney, Tom Petty]), moderator Maureen Droney (Managing Director, The Recording Academy P&E Wing), and panelist Mark Waldrep (recording engineer and owner, AIX Records). Photo courtesy of The Recording Academy®. © 2015. 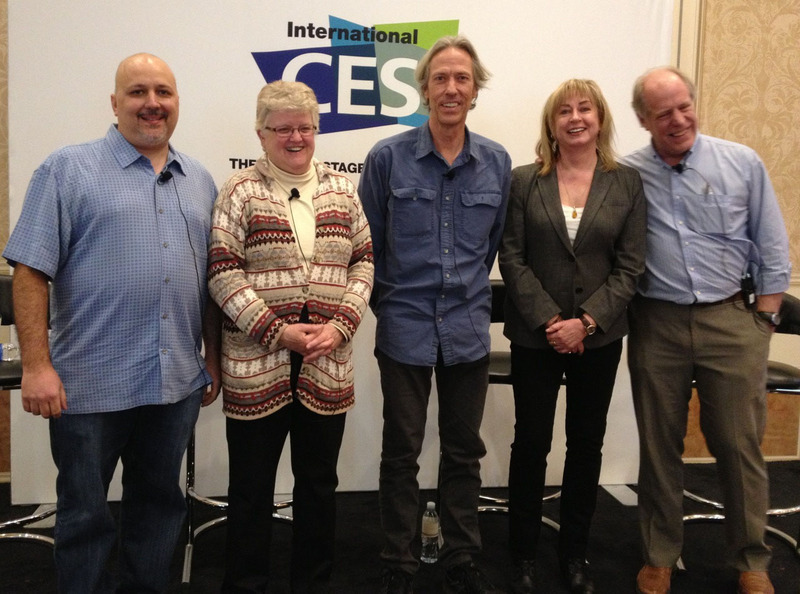 Santa Monica, Calif. (January 21, 2015) — The Recording Academy® Producers & Engineers Wing® had a strong presence at International CES 2015, which took place Jan. 6 - 9, 2015 in Las Vegas. This year's convention saw growth over last year's, with over 160,000 attendance and 2.2 million square feet of exhibition space. The P&E Wing used the convention as an opportunity to continue educating about High-Resolution Audio and related issues by participating in two panels, produced by DEG: The Digital Entertainment Group: 'Meet the High-Res Music Creators' and 'Hi-Res Audio: CES Power Panel.' These were among six panels produced by DEG for the Hi-Res Audio Workshop, which took place Tuesday, Jan. 6, through Thursday, Jan. 8, at the Venetian. Sponsored by The Recording Academy P&E Wing, this panel offered attendees the chance to join top producers and engineers as they discussed the music creation process and shared best practices for recording, mixing and mastering in high-resolution. Maureen Droney, Managing Director, The Recording Academy P&E Wing, served as moderator, with panelists Rob Friedrich, GRAMMY®-winning producer/engineer, Five/Four Productions; Leslie Ann Jones, GRAMMY-winning engineer and Skywalker Sound's Director of Music Recording & Scoring; Ryan Ulyate, producer and engineer (Jeff Lynne, Paul McCartney, Tom Petty); and Mark Waldrep, recording engineer and owner, AIX Records. This panel gave attendees the chance to meet and mix with some of the biggest names in consumer electronics and music entertainment as they exchanged ideas about the key issues that are facing the industry today. Marc Finer, Senior Director, DEG, served as moderator, with panelists Robert Heiblim, vice chairman, CEA Audio Division Board; and Maureen Droney, Managing Director, The Recording Academy Producers & Engineers Wing. Photo Caption: The panelists and moderator of "Meet The Hi-Res Music Creators," which took place on Tuesday, January 6. Pictured L- R: panelist Rob Friedrich (GRAMMY®-winning producer/engineer, Five/Four Productions), panelist Leslie Ann Jones (GRAMMY-winning engineer and Skywalker Sound’s Director of Music Recording & Scoring), panelist Ryan Ulyate (producer and engineer [Jeff Lynne, Paul McCartney, Tom Petty]), moderator Maureen Droney (Managing Director, The Recording Academy P&E Wing), and panelist Mark Waldrep (recording engineer and owner, AIX Records). Photo courtesy of The Recording Academy®. © 2015.